Hello everyone! Welcome to Day 2 of the DIEcember 2018 Release Blog Hop! Make sure to read until the end if you want to know all the details and also how to participate in a giveaway! ¡Hola a todos! Bienvenidos al segundo día del blog hop celebrando DIEcember 2018. Os recomiendo leer hasta el final para conocer todos los detalles y cómo participar en el sorteo ;). I made this card using the Outline Floral Frame Die and the Tiny Words stamp set from a previous release. For the background I used Distress Inks to create a rainbow and then simply focused on all the details that gave the card a nice "fairy-tale" look (at least that's how it looks to me ;)). He hecho esta tarjeta usando el troquel "Outline Floral Frame" y el set de sellos "Tiny Words" de una colección anterior. Para el fondo he usado tintas Distress para crear un arcoiris y después me he centrado en añadir todos los detalles que le dan a la tarjeta ese toque de "cuento de hadas" (o al menos es lo que a mí me parece ;)). If you want to see how I made this card, there is a video that you can watch below these lines or at my Youtube channel. Si queréis ver cómo he hecho esta tarjeta, podéis ver el vídeo bajo estas líneas o en mi canal de Youtube. If you want a bit more inspiration with this new release, you can check my previous post here and you can also check Day 1 of the Diecember Blog Hop here. Si queréis más inspiración con esta nueva colección, podéis ver mi entrada anterior aquí y también echar un vistazo al primer día del blog hop aquí. 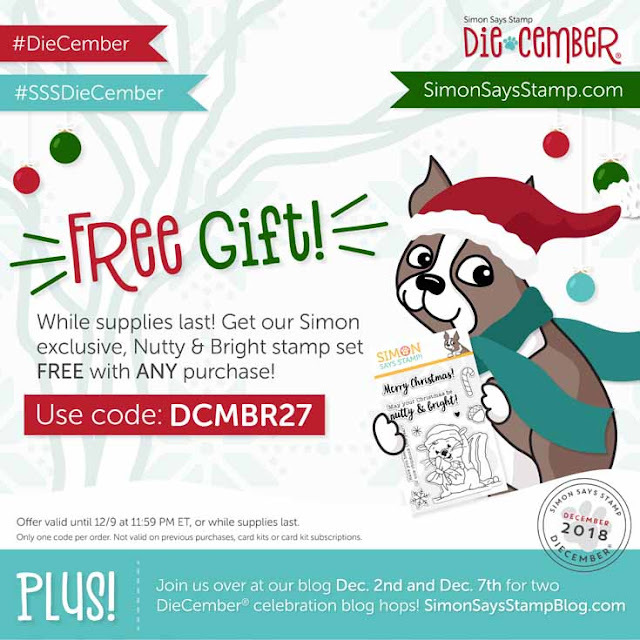 This post is part of a blog hop celebrating Simon's newest release and of course there is a giveaway! Simon is giving away a $25 gift card to a lucky winner at each stop on the hop! You just have to leave a comment, so make sure you visit every stop for more chances to win! The winners will be announced on Simon's blog on Wednesday 12th. Esta entrada es parte de un "blog hop" celebrando la nueva colección de Simon Says Stamp y como siempre ¡hay un sorteo! Simon sortea una tarjeta regalo de 25$ en cada una de las paradas del blog hop. Simplemente deja un comentario para participar. Los ganadores se anunciarán en el blog de Simon el miércoles día 12. Now time to hop! Next stop is the super talented Yoonsun Hun! ¡Hora de saltar! La próxima parada es la increíble Yoonsun Hun! This is really pretty! :) Love the rainbow background. Gorgeous cards! Love the background on the "fabulous" card! OMG! That background took my breath away when I first saw it, as it is so beautiful and looks perfect with that die cut! These are both so pretty. I especially love the 2nd card, it is breathtaking. Your cards are so lovely! Thank you for sharing with us! Wow!!! These are beautiful cards!!! Love these gorgeous cards. The pastel backgrounds are so pretty. Wow! Beautiful cards!!! Amazing colouring!!! Wow!! Absolutely Gorgeous cards! I love these soft colors. Thanks for the inspiration. the grey on top of that gorgeous background is really great! Love your pretty card. All the die cut needs is a beautiful bg and ta-da! Well done! Beautiful cards and lovely backgroung on your 1st card. thanks for the video. Thank you for sharing your beautiful designs using the new floral outline die and the tulip die. Your color blending turned out amazing. Beautiful backgrounds. Love the floral frame!! These are gorgeous. I love your ink blended background and all of the pretty details on the first one, and that tulip is stunning. I LOVE the grey---it is wonderful. The dots are a nice addition too. Lovely. Beautiful work here- stunning background! I love your blending of the distress inks in the first cards. It looks magical!! Your second card is so pretty!! I love it!! Wonderful framing, colors & style. Love the floral frame die. Nice job! Thanks for sharing! Beauty on cardstock ! Fantastic blend of gorgeous colours, your blending is seemless. Thank you for sharing such a fabulous piece. You are, indeed, fabulous, Amanda! Love the soft colours on the first card, and the inlay die cutting is fab on the second one! Gorgeous cards - both of them! Love the details on the first one - white colored pencil and white gel dots do make a huge impact on the overall design. Great look!! SQUEAL!! I LOVE your Creations!! So BEAUTIFUL!! THANKS for sharing and have a FABULOUS WEEKEND!! I love the soft colors with the gray frame and white accents, so pretty! Great card! I love the die and the colors. Beautiful card-love the colors you've used! This is awesome! I love the sparkles and little drops and the COLORS WOW! Such a pretty card, really love how the white accents make the rest of the card pop! both pretty cards - but I love your rainbow tulip card - I love love love that die! A beautiful die and you certainly made the most of it with those colours. Simply gorgeous. Gorgeous ... love your examples using the new dies. Beautiful card, blending of the colors give it a gorgeous look and the outline dies looks amazing! Thanks for the inspiration. Your outline floral frame card shows how easy it is to create an elegant card when you have the right tools. Lovely. I love your card. The colors are awesome! Beautiful card. The outline die is so pretty. Love the blended colors. I really appreciate that you did a focus on embellishments. I often have trouble finishing off cards satisfactorily, so this was very helpful. Thanks for sharing your lovely cards with us! I really love your rainbow background. The colors are so soft. Beautiful cards and I love that bright rainbow background. So pretty!! Love the mix of colors in the background, the die is super gorgeous. lovely card. The shading of the colors is gorgeous. Love the outline die. Very elegant. The tulip is so pretty. Absolutely gorgeous. The Outline Floral die is so elegant and your background is stunning. The soft rainbow background is so beautiful with this die and then you softened it a little more with water. This die encircles the focal point which is the purpose of the card and/or message to the receiver. Gorgeous colors to show off that pretty die! The first card has indeed a Fairy-look, it's a bit magical. Thank you for showing adding details to a card on a way that a simple card gets stunning. The second card in your post is also awesome! Thank you so much Amanda for sharing. Adore the gorgeous rainbow background. It is so soft and dreamy! I really love the frame dies in this release. Before I saw your card and watched your video, I wasn’t sold on the floral frame die, however, seeing how you used it, I’m sold. Thank you for your inspiration! Both cards are beautiful. Sovery stunning, love how you inlayed the pieces back to the die cut. I am fascinated with inlay. So stinking pretty! Both of your cards are gorgeous! I love the addition of the white details on the floral frame card, and how you cut the die with grey cardstock. It's lovely with the soft, rainbow background. The different colors you pieced into the tulip on your second card are so pretty. WOW - your floral frame card is FABULOUS, your inlaid tulips GORGEOUS! Very pretty card and anot elegant die. I love these, so beautiful. I really like the inlaid tulip. The colors on both of your cards really stand out!! Super beautiful! Such pretty cards!! I really like them both, especially the one with the outline floral frame!! I love both of your designs. The soft colors are perfect!! I just love the background you created, and how you filled in the different shades of paper for the 2nd card. Such wonderful ideas, and inspiration to use. Oh, they're both just gorgeous and are on my wishlist for sure! Cards are very pretty; beautifully created love, love, love the Celebrate card ( my favorite ) ! This is a gorgeous new die! I love that it makes creating a card a breeze. Beautiful cards! I love the grey on those colours you used! What a gorgeous card! I love your added details! Thank you for another great tutorial. Gorgeous rainbow blend. Great release! SSS never disappoints. Ooo . . . these are both so beautiful!! These cards are both so elegant. So finished. Perfect. Wonderful cards, so festive! Love this new release!